Bristol's magnificent concert pipe organ in the Colston Hall celebrates its 60th birthday this year. This amazing instrument has 5372 pipes, ranging from the size of a drinking straw up to a whopping 32ft long! Placed behind a grille above the stage the pipes are pretty much hidden from view to the audience, but they certainly get heard when played from the organ console, which has four keyboards, a pedal keyboard, and almost 100 'stop' knobs for the player to operate. Built by Harrison and Harrison of Durham in 1956, it's one of the world’s famous concert hall organs. We all get the chance to hear it for FREE on Tuesday 20 September when Richard Hills, a brilliant performer, who is equally at home in both classical and theatre style, will be the headline performer at this concert which kicks off at 7.30pm. This will probably be the last dedicated organ concert before the Colston Hall closes for its major refurbishment mid-2017. 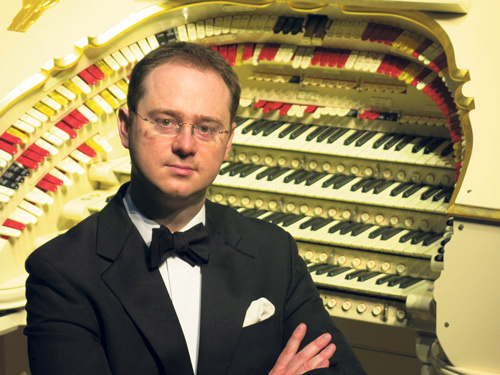 Richard, a globally acclaimed musician, has appeared many times on national and international TV and Radio, including at the Royal Albert Hall, giving a solo recital in the 2013 Proms, the first ever to feature lighter organ repertoire. This concert is absolutely free, no ticket or booking is required - just come along. A charity collection will be taken during the evening for the IAO Benevolent Fund and the Colston Hall Organ Concert Fund.